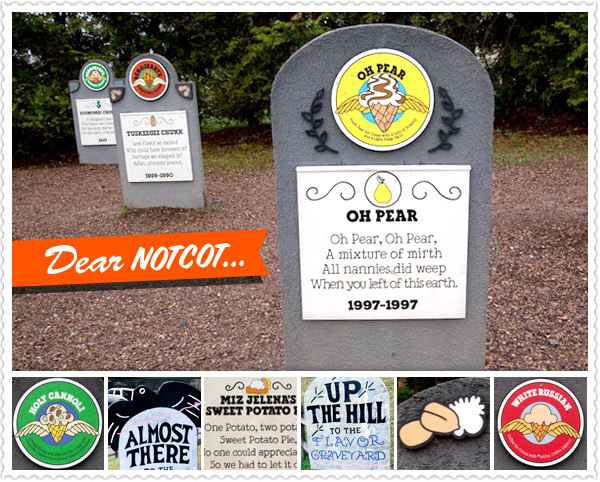 In this Dear NOTCOT guest post, Jackson Stakeman shares the first part of his Ben & Jerry’s adventure! Before we get to the ice cream, here’s a tease that shows the company’s playful side. 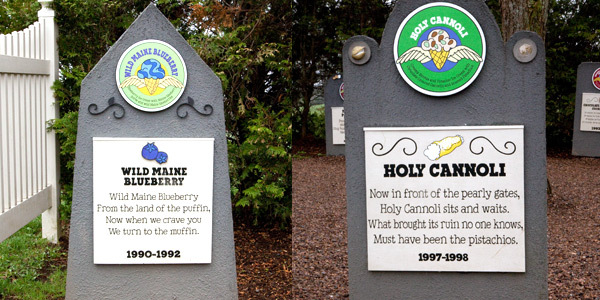 The factory tour of Ben and Jerry’s is like an ice cream version of Willy Wonka’s chocolate factory. Plenty to see, plenty to taste, wonder around every corner. But that is still to come! 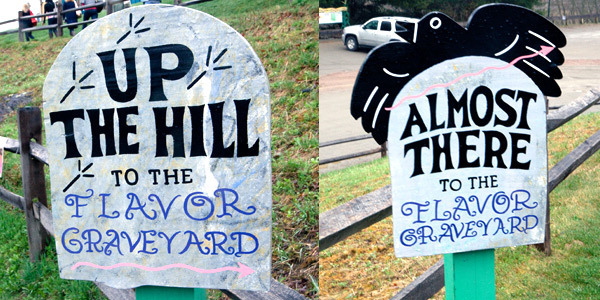 First to whet your appetite … Equally fun, despite its lack of edible ice cream, is the Ben and Jerry’s Flavor Graveyard. On a small hill overlooking the factory lie the remains of some of the flavors that had their time upon this earth cut short. 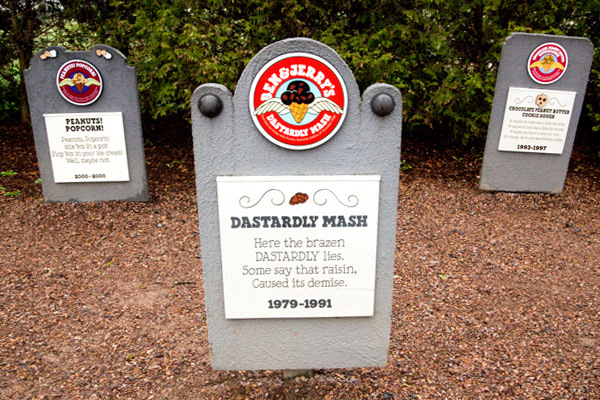 Ben & Jerry’s gracefully placed these flavors into the earth and marked them with hilarious rhyming epitaphs. For the company’s 25th birthday celebration, factory workers dressed up an unearthed Dastardly Mash. Zombie ice cream…. sounds delicious! 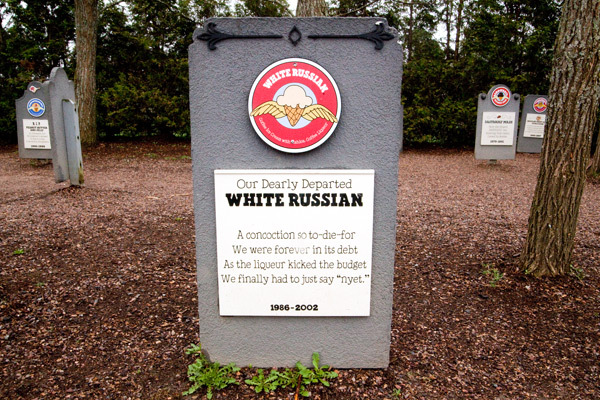 White Russian Ben and Jerry’s is back! I just had a white russian milk shake at the Mount Kisco NY scoop shop. I have no idea how long it will be back though. wah, they actually have space to set up such tombstones, and write such good lines. They do take it seriously dont they. Well, no complains, I love their ice-cream! got my mom “addicted” on a Cookie Affair. But White Russian was so good! Really, though, these are cute, and it’s nice that they’re a bit educational, too. Good capture.